This article tells information about Cenang beach (Pantai Cenang) - description, nearby attractions, activities, accomodations (hotel & resorts) available, food & beverage and more! 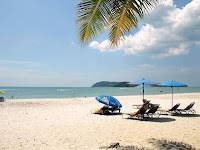 Being the prime beach in Langkawi, Pantai Cenang (location in map) features fine powdery sand and many beach-front restaurants and bars. This 2 km long beach is situated at the south-western tip of the Langkawi Island. ZERO Fare! 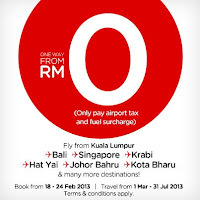 Only pay airport tax and fuel surcharge to Langkawi! 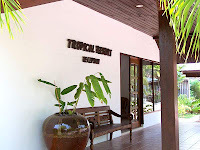 Malibest Resort is located in Cenang beach. Malibest Resort is a family-owned hospitality company that pride themselves in providing outstanding customer service and facilities for their guests who will always enjoy a friendly, professional staff and a clean, comfortable, and safe atmosphere. Most of their guestrooms are seafront with spacious walk-out balconies. They even offer family-sized beach homes near the locations. Tropical Resort Langkawi is located in Tengah beach. Tropical Resort Langkawi hails itself as a budget accommodation in Langkawi which emphasis on clean, quiet and real value for money. It is established in year 2000, and renovated in 2012. Berjaya Langkawi Resort is spread over 70 acres with the chalets set amidst a lush tropical rainforest or over the beautiful waters of the Andaman Sea. Enveloped within nature’s wonderland and with spectacular views over the Burau Bay, your stay here will be relaxing, interesting, enjoyable and very memorable. It is a 5-star accomodation managed by Berjaya Hotels & Resorts, a premier hospitality group that owns international hotels and resorts in Malaysia, Singapore, Philippines, Seychelles, Sri Lanka and London.